Many of us get find great hair colors and perfect hair styles to complement our lifestyles and the looks we’re trying to accomplish. However, when we look in the mirror, something is still missing to really bring it all together. What could be missing are perfect brows and lashes to really finish off the whole look. If you have thinning brows, brows or lashes that are naturally light with no definition or length, or if you’ve just gotten tired of daily attention with mascara and eyebrow makeup, then brow and lash tinting may be just what you need. Eyelash tinting makes your natural lashes look longer and fuller without extensions and daily use of mascara. 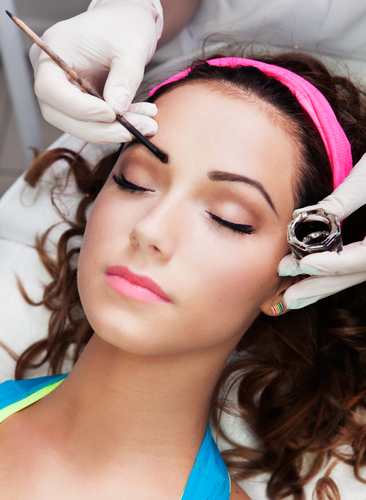 Eyebrow tinting complements your tinted eyelashes by giving you a more dramatic, defined, and put-together look. There’s a variety of colors to choose from in many shades from deep black to a plethora of browns to promise success no matter your skin tone and hair color. ** Cut your time in the morning in front of the mirror to help maximize your busy schedule. ** Tint dyes are less irritating than mascara to keep your eyes from itching and watering. ** Clumpy and smudged mascara by the end of the day? No longer an issue with tinting! ** Eyebrow & eyelash tinting is ideal for athletes, swimmers, trainers, and others who are always on the go, in the water, or exercising. Look perfect in every condition. The tinting process is quick and easy. Result usually last up to four weeks. As semi-permanent makeup goes, it’s the perfect opportunity to try something that will help your overall appearance without committing long term. However, we promise once you do it, you’ll love it! Call to make an appointment today or use our free mobile app at your convenience. Let our team of professionals at Von Anthony Salon show you how to perfect your look with eyebrow and eyelash tinting. Call us at 972.731.7600 to schedule your appointment or use our mobile app by downloading it free from iTunes, Google Play, or Amazon.